That's a good point. IIRC in Starfighters of Adumar, didn't they have to get their Xwings refueled in the big final fight, after only a few hours using them cause of the fuel use.. If it were me, I'd have the Capital Ships move painfully slow, and serve more as obstacles rather then combatants in an atmospheric battle. But that's more narrative handwaving then mechanics. Not to mention that ISDs hovering inside an atmosphere has been a a thing ever since Rebels Season One. Hell, it's been a thing ever since Spark of Rebellion. I wasn't surprised to see it in Rogue One. That thing is gonna scrape the Golden Gate Bridge if it's not careful! My solution to that problem is to apply scale modifiers to both maneuverability and acceleration. Basically, if a starfighter makes a turn, a capital ship is at -6D to perform the same maneuver, with the penalty decreasing by 1D per round. The pilot of the capital ship may wait until the penalty drops off completely, or he may try to force the turn with penalties still in effect. While not wholly realistic, it does at least simulate that a much larger ship will be much slower to turn and maneuver than a smaller, more nimble one. As far as acceleration and deceleration, I ruled that a Capital Ship takes one additional round per 2D of scale difference to accelerate or decelerate. Basically, any capital ship trying to chase a starfighter would take three rounds to accelerate from cruising to full speed, or to decelerate to cautious. Am I ever glad that this thread was resurrected. Thank you for this new house rule. Adopting it (or some variation of it) immediately. That's a cool @$$ pic! By their stats, WEG wasn't too keen on allowing capital ships to operate within a planet's atmosphere, apart from the smaller ships and a few special exceptions. The prequels, in turn, blew that theory away by allowing even ships the size of the Venator to operate within a planet's atmosphere, even to land and take off again with some docking assistance. With that in mind, what ships on the WEG roster should, in your opinion be given an Atmosphere rating? 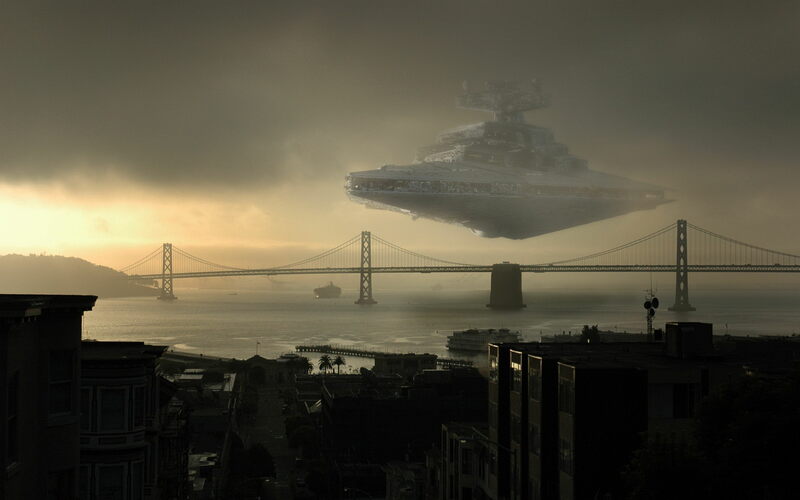 In the The Empire Strikes Back I saw an entire city hanging in an atmosphere of a gas giant. I think SW tech can handle any ship in the atmosphere. Strange that WEG did not take this into account. Can we minimize that massive picture so this thing isn't such a pain to read now? I think it was posted before the switch over, usually Whill swoops in and changes it to a link pretty quick. I figured if I flagged it, he'll probably get to it sometime today.